From 2010 – August, 2013, this was www.governor.maryland.gov. 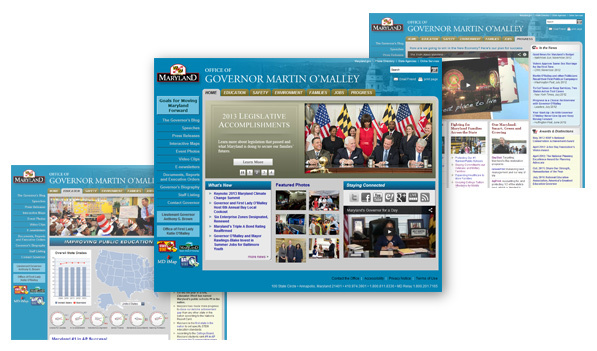 Maryland’s Governor website introduced and implemented blogging capabilities, live streaming video, interactive graphs, photo galleries, RSS feed, online forms and social media integration. HTML/CSS/WordPress hybrid. Based on the 2011 statewide template I developed with the Department of Information Technology. In 2013, the site was revamped to deliver responsive design using a mobile-first approach. Users voted online Oct. 29-Nov.9 to choose Maryland’s best blogs and social media accounts in The Baltimore Sun’s fourth annual Mobbies.